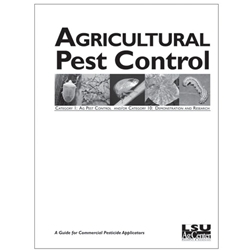 This study guide is for those wanting to become certified in Category 1: Ag Pest Control and/or Category 10: Demonstration and Research. Category 10 includes individuals who demonstrate to the public the proper use and techniques of application of pesticides with restricted uses – or who supervise such demonstrations or people conducting field research with pesticides – and, in doing so, use or supervise the use restricted use pesticides. Includes color images of common diseases, insects and weeds.